My responsibility as a mother is to teach my children how to be good adults who are capable of making wise decisions and living well. Part of that job comes with teaching the kids responsibility. I’m continually amazed at how well my kids respond to routine, to chores that must be done, and to planning and practice. When they can see that things are fair – that the jobs they do are for their own well being as well as everyone else’s – things run smoothly and the housework is shared. With the kids taking care of themselves, I can get myself ready and do my own jobs, and we all get out of the house with little stress and feeling positive. It really makes a difference! I found that creating a “Morning Jobs” list for my children and sticking it to the kitchen wall really helps keep things on track. The kids can see for themselves what needs to be done, and I don’t need to micro-manage them. My kids are aged 9 and 7, but any children past babyhood can usually help in some small way. 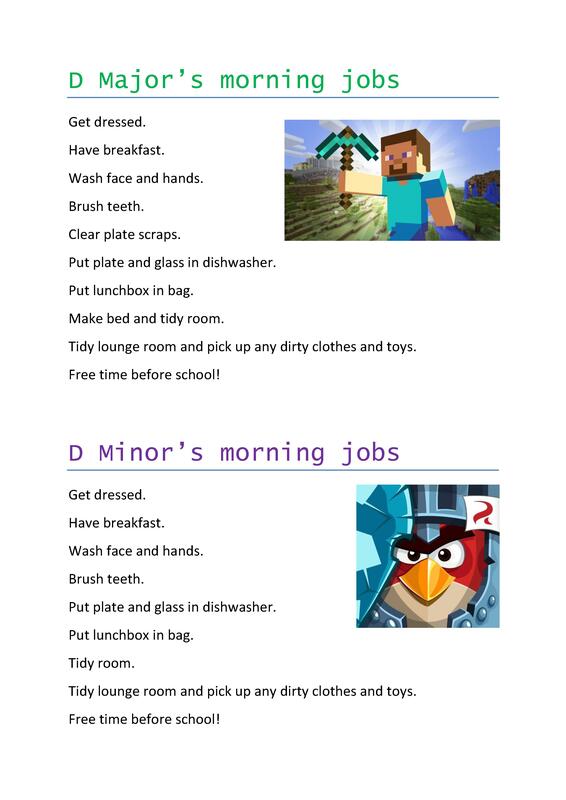 Our morning jobs list (kids names changed for online)> Yes, my son loves Minecraft and my daughter loves Angry Birds!